The Gas Module II adds state-of-the-art gas monitoring and analysis capabilities to the Datascope Passport 2® vital signs monitors. The Gas Module II with optional Spirometry measures airway pressures and lung volumes directly at the patient’s airway. This data, along the loops and numeric data that you need can be displayed on the Spectrum OR™. 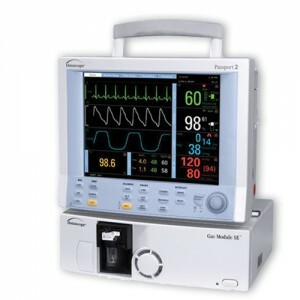 The Gas Module II is a breath-by-breath gas analyzer, designed to meet the comprehensive anesthesia monitoring requirements of virtually every hospital and freestanding surgical center - whatever its size, specialty, or patient base. Fully integrated into Passport 2, Spectrum and Spectrum OR user-interface and displays. Breath-by-breath Fast O2, CO2 and N2O monitoring with automatic or manually controlled measurement of five anesthetic agents. In addition, MAC values can be displayed on the Spectrum OR. Optional Spirometry measures patient’s airway pressures and lung volumes. The numeric data and loops can be displayed on the Spectrum OR. Click the button below to add the Datascope 5 Agent Gas Module II for Passport 2 to your wish list.